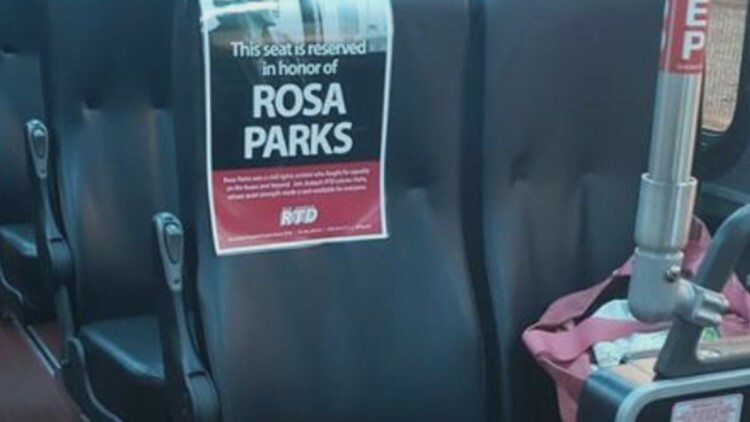 The civil rights icon refused to give up her seat to a white man in 1955 and, to honor the historic act, San Joaquin Regional Transit District has reserved every front RTD bus seat with a commemorative sign. STOCKTON, Calif. — Civil rights icon Rosa Parks refused to give up her seat to a white man in 1955 and, to honor the historic act, San Joaquin Regional Transit District has reserved every front RTD bus seat with a commemorative sign. Her civil disobedience sparked what became known as the Montgomery Bus Boycotts in Montgomery, Alabama. In 1955, Rosa Parks refused to give up her seat to a white man on a public bus and was arrested. Over a year later, the landmark Browder V. Gayle federal case gave way to the U.S. Supreme Court declaring that bus segregation in Montgomery and Alabama was unconstitutional. To honor her historic act, San Joaquin Regional Transit District (RTD) reserved the front seat on every RTD bus with a commemorative sign. February is Black History Month, and the signs were in place from Feb. 2 to Feb. 4. Rosa Parks is officially celebrated in California on her birthday, Feb. 4th.